“We are pleased to assist our European customers in acquiring high performance, fully upgradeable Mobile Workstations, SuperGaming VR Laptops, Mobile Servers and Ultraportable laptops with local European technical and sales support.” Mark Bialic, Eurocom President. Eurocom is a leading developer of fully-customizable, CPU- and GPU-upgradeable, heavy-duty, long-lifespan laptops. Eurocom is committed to offering our clients, our suppliers, and our employees a new sense of freedom through innovative, customizable, and upgradeable laptop technology, ahead of its time. In 2017, Eurocom is focusing on the development of high-performance GPU- and CPU-upgradeablelaptops based on socket CPUs and slot (MXM) GPUs – and to continue to provide long-life span laptops and keep up the Eurocom tradition of upgradeability. All Eurocom products are engineered for highest quality, best performance, long-term stability, and serviceability. Each Eurocom laptop features unmatched upgrade-ability. Whether you want a faster CPU, more memory, more storage, or even a newer GPU - you can have it installed at any point in the future without hassle. 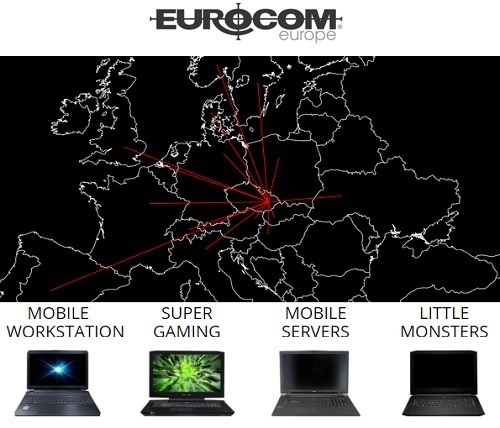 With Eurocom Europe, customers have the best Eurocom has to offer with the added benefits of local representation. Now customers have a local, dedicated sales and support representative to assist them with selecting the best mobile technology to suit their needs. “If you live in Europe and are looking for highly capable, high performance, fully upgradeable laptops than Eurocom-Europe is the place to look. We offer a 2-year warranty, free shipping within the European Union and Tax-Free purchases for corporate clients” Ondrej Kahn, Eurocom Europe representative. Eurocom assists customers all over the world and has accumulated a vast wealth of shipping expertise to ensure customers receive their much-needed technology without any problems. Customers will now have quick, easy and free shipping from within the European Union. An outstanding 2-year warranty from Eurocom Europe ensures customers technology is there for the long haul and with support and repairs being handled within the EU, clients have convenient technical support. Every Eurocom laptop is shipped with a laptop carrying bag so users are ready to use their system right out of the box. Every laptop from Eurocom Europe comes with premium thermal paste to keep the heat generating components within the chassis as cool as possible. Eurocom is the leading developer of long lifespan, fully upgradable notebooks, as well as, high-performance mobile workstations and servers since 1989. Eurocom prides itself as an Industry leader in providing ground-breaking technology and continues to engineer innovative solutions that inspire individuals and companies to new growth and development. For more information on Eurocom, please visit us at www.eurocom.com.